Western blot analysis of extracts from 293T cells, transfected with 100 nM SignalSilence® Control siRNA (Unconjugated) #6568 (-) or SignalSilence® GRB2 siRNA I (+), using GRB2 Antibody #3972 (upper) or β-Actin (D6A8) Rabbit mAb #8457 (lower). 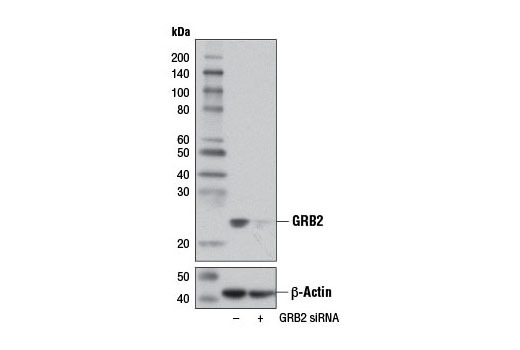 The GRB2 Antibody confirms silencing of GRB2 expression, while the β-Actin (D6A8) Rabbit mAb is used as a loading control. CST recommends transfection with 100 nM SignalSilence® GRB2 siRNA I 48 to 72 hours prior to cell lysis. For transfection procedure, follow protocol provided by the transfection reagent manufacturer. Please feel free to contact CST with any questions on use. SignalSilence® GRB2 siRNA I from Cell Signaling Technology (CST) allows the researcher to specifically inhibit GRB2 expression using RNA interference, a method whereby gene expression can be selectively silenced through the delivery of double stranded RNA molecules into the cell. All SignalSilence® siRNA products from CST are rigorously tested in-house and have been shown to reduce target protein expression by western analysis. Growth factor receptor-binding protein 2 (GRB2) is an adaptor protein that is involved in RTK signal transduction. The SH2 domain of GRB2 binds to tyrosine phosphorylated proteins such as EGFR, IRS-1, Shc and Gab1 (1). The SH3 domain of GRB2 associates with Sos, which stimulates the GTP binding activity of Ras, leading to the activation of the MAP kinase and other signaling pathways. Phosphorylation of Tyr209 of GRB2 by Bcr-Abl and EGFR abolishes its association with Sos and negatively regulates downstream signaling (2). Pawson, T. and Scott, J.D. (1997) Science 278, 2075-80. Li, S. et al. (2001) EMBO J 20, 6793-804.